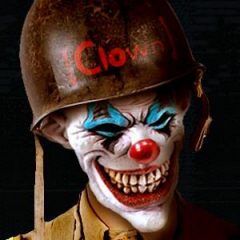 [CLOWN]GeneStealer (aka Ewell) has been working on a skin for each CLOWN member, putting your clown persona in the Allied Airborne uniform. The next step is to give us all an Axis counterpart. Take a look at your new image on the member page. Let us know right away if you want a different face. In fact, we will probably be putting together a CLOWN skin kit that you can use to alter your face however you want. Maybe you want to use a real picture of yourself! If you haven’t yet sent us a clown pic (or your member profile information) please do so as soon as possible. Next week we will have our first practice together and we can pose for a group portrait. LOL. We’ve been recruiting a lot more CLOWNs since we got the new server, and I’m having a hard time keeping up with the member page. We will be assigning emails to CLOWNs that want one. Ewell is helping me out with getting that working. We have new Ronald McDonald and Hobo skins. Check them out on the skins and screenshot pages. Just download them into your MOHAA/main/ directory. They’ll work without forcing skins on the CLOWN, TIME, and Infidel servers. One of these days, we ought to have a parade down Crossroads Street, with our friends from other clans watching out the windows! We’ve finally got a server we can call home. The ip is 204.157.6.156. We also have a Team Speak channel so we can talk to each other as we play, and an email address for each member. I just need some time to figure it out! See you on the [CLOWN] Server. This means we can also pick up recruiting. If you know of anyone who is interested, have them come play with us. We’ve had an issue the past couple of days with a member of CLOWN publicly accusing a member of another clan of cheating. We cannot allow this to happen again. In the future, if you suspect any player of cheating and wish to pursue it, please report it to me first. Of course, outside of CLOWN you can do as you wish, but any accusations submitted using the CLOWN name must come through me.